Thomas was much more than an entertainer. In 1985 he received the Congressional Gold Medal for his humanitarian work founding St. Jude Children's Research Hospital in 1962 and supporting it all his life. The hospital specializes in treating children for catastrophic pediatric diseases. No child is turned away. This year is the 50th anniversary of the hospital's founding. His commitment to St. Jude's had its roots in the immigrant neighborhood in which he grew up. There he saw children die from curable diseases because of the lack of available health care. He knew this was wrong. He wanted to do something to help and founded St. Jude's, a hospital that treats children of all races, religions regardless of ability to pay. 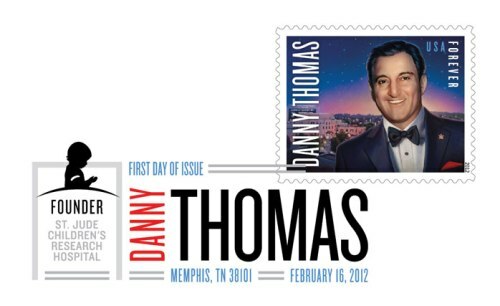 The Forever First Class rate stamp shows Danny Thomas in the foreground with the St. Jude Children's Research Hospital in the background. The 2012 United States Major League Baseball All-Stars series was one of the most anticipated stamp issues in recent memory. More than 2-million stamps were purchased during a special pre-order competition setting a new record. O. Henry (the pen name of William S. Porter) wrote over 300 stories. The Gift of the Magi and The Ransom of Red Chief are two of his most famous. On September 11, 2012 the United States Post Office issued a stamp in celebration of the 150th anniversary of his birth.